After all that talk of the best commercially made gochujang, I can’t avoid discussing the best commercially made doenjang. With gochujang, spicy red pepper paste, and ganjang, soy sauce, doenjang is part of the holy triumvirate of the Korean world of condiments. Condiment actually is too weak a word, as it implies something that’s spread thinly or dabbed lightly. Doenjang, though, is thrown in by the generous spoonful. 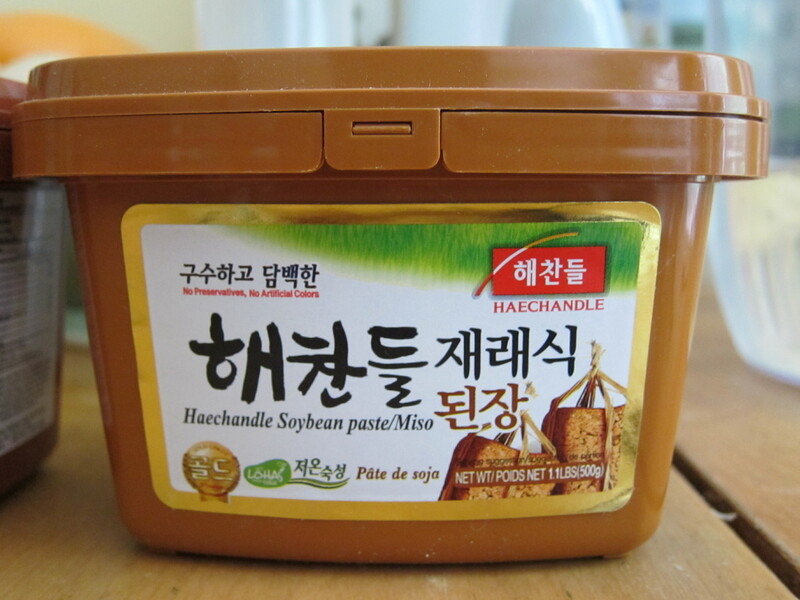 It’s essentially fermented soybean paste, and much more central to Korean cooking than ketchup or mustard. It’s the main seasoning in doenjang-jjigae, or soybean paste stew; it’s prominent in ssamjang for wrapping meat and rice in lettuce; and it’s gets mixed into any number of banchan or small side dishes. It’s lazy seasoning, a quick and easy way to add depth and flavor to almost anything, meat or vegetable. Except, of course, if you make your doenjang from scratch. The basic ingredient for both is soybeans. 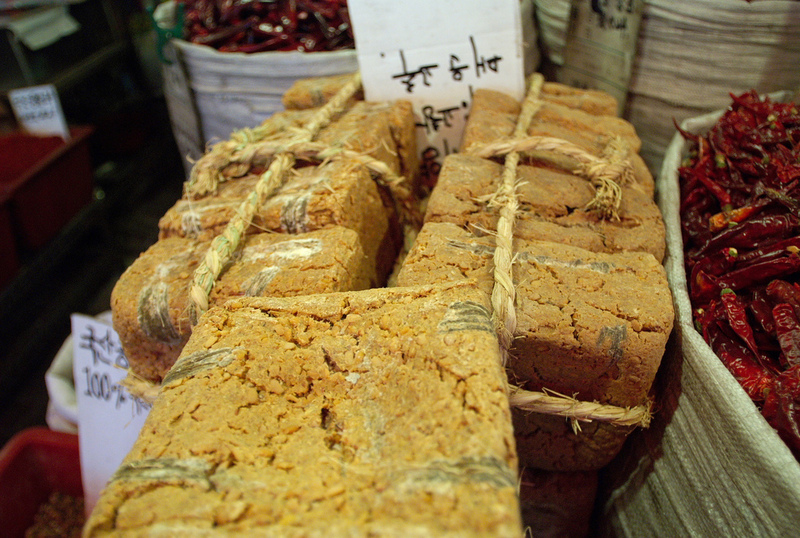 The beans are boiled, mashed, and then shaped into blocks, called meju. They’re left to hang in a warm place to dry and ferment for up to three months. According to My Korean Diet, you really have to baby these blocks, taking them outside to see the sun, bringing them in at night, and putting them to bed on a warm floor nicely covered with a blanket. When a bacterial fuzz starts to appear on the blocks, you know you’re doing the right thing. My mom made her own doenjang, but she never made these blocks — the smell they emit as they dry is unbearable in a modern home. Instead, she started at the next step, which is to take the blocks and place them in large earthenware pots full of brine. Grains like rice, wheat, or barley are added, the exact mixture depending on the region and its preference, as are hot peppers. The whole mixture ferments for two months, meaning the whole process can take five months. The whole mixture will eventually separate into a liquid and a solid. The liquid becomes soy sauce; the solid becomes doenjang. The flavor of doenjang has that distinctly umami flavor of soy sauce. It’s comparable to miso, except it’s a hundred times more assertive. While soy sauce is used in Japan and China, doenjang was associated so uniquely with Korea, the Chinese called the smell of doenjang “the smell of Korea.” I have a feeling it was not meant as a compliment. But for me, the stinkiness of doenjang is like the stinkiness of a strong blue cheese, an aroma I will follow until I find the source. And doenjang has “five virtues“! Devotion, because it maintains its flavor even when mixed with other ingredients. Steadfastness, because it keeps practically forever. The merciful heart of Buddha, because it removes fishy odors and oily flavors(!) Generosity, because it neutralizes spicy flavors. And finally harmony, because it harmonizes well with other foods. The fact that people in the past used it as a poultice for bee stings and minor scrapes is clearly the least of its stellar attributes. 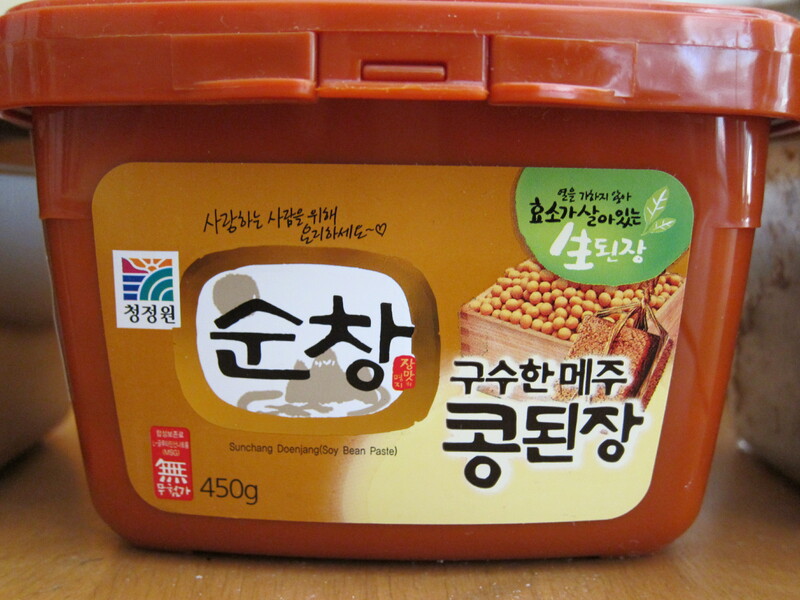 Like gochujang, most brands of doenjang sold outside Korea do not have prominent English-language labels. 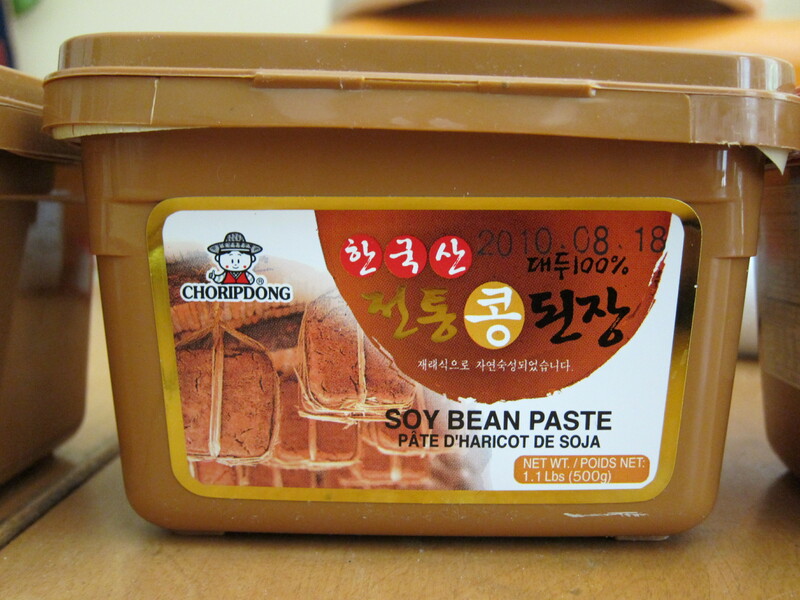 But most of them will say “soybean paste” somewhere, and they tend to be sold in brown tubs, to indicate the color of the paste inside. In addition to the brands we tasted for gochujang, we also tried 해오름 or Haioreum, which means “Rising Sun.” Hence, the sort of abstract sun rays coming out of an arc. 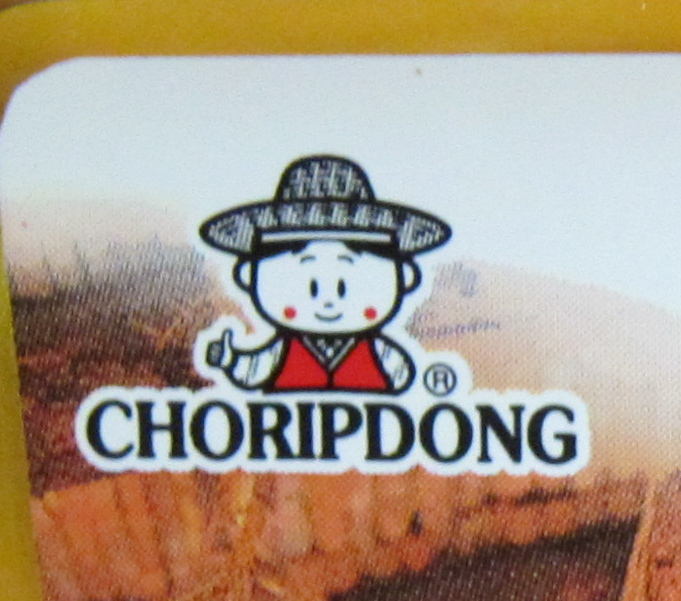 And Choripdong, which is written in English and has a memorable cartoon character of a man in a traditional outfit giving you a big thumbs up. Unfortunately, there was little drama here. No outstanding winner, no close race between worthy contenders. 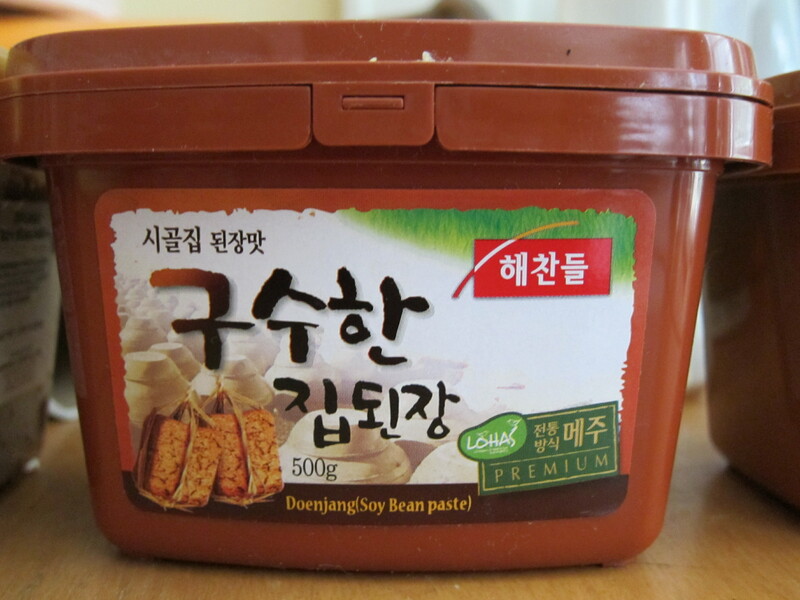 Even more than the gochujang, all of the commercially available doenjang was decent. Diane did have a favorite, and we had a least favorite, so we’ll start there. Special Claims: 순창 (Sunchang), meaning from the city of Sunchang, which is famous for its gochujang. Nutty and made with beans, which doesn’t make any sense to me since aren’t they all made with beans? Diane liked best the intensity of this one, which she described positively as reminding her of socks. It tasted “real” and smoky. Perhaps that’s what her socks smell like. The one we liked least was again the O’Food organic brand, which didn’t have much flavor. It was noticeably drier and grittier than the other ones, and on top of it, more expensive. Special Claims: Traditional Thatch-Roofed House, Country-Style Doenjang, with Nutty, Deep Flavor. This was nicely not too salty, with a slightly syrupy flavor of molasses. The Choripdong brand had little chunks of beans in it and was saltier than the Haioreum, but still good. This one was earthy and rather cheesy in flavor. This one was noticeably darker in color than the others, with a smoothness of texture similar to gochujang. It also tasted overwhelmingly of soy sauce to me, and saltier than most of the others. There are so many more types of doenjang out there. We tasted six, but there were probably at least 15 kinds crammed into the shelves of Hmart on 32nd Street. Each brand makes multiple types, some of which claim to be best for stew, some of which boast a chunky, beany paste. Your choice, like the way you can choose between smooth or crunchy peanut butter. Many of the ones we tasted, and some we didn’t, are available online here. Luckily, like gochujang, no doenjang will fail you. There is doenjang out there that will blow your socks off, but it’s probably not in a plastic tub. Until you can find a Korean grandmother to sell you some of her homemade stuff, at least you know more or less any doenjang will do. This entry was posted on August 25, 2010 at 4:32 pm and is filed under Korean Food, Tastings. You can follow any responses to this entry through the RSS 2.0 feed. You can leave a response, or trackback from your own site. 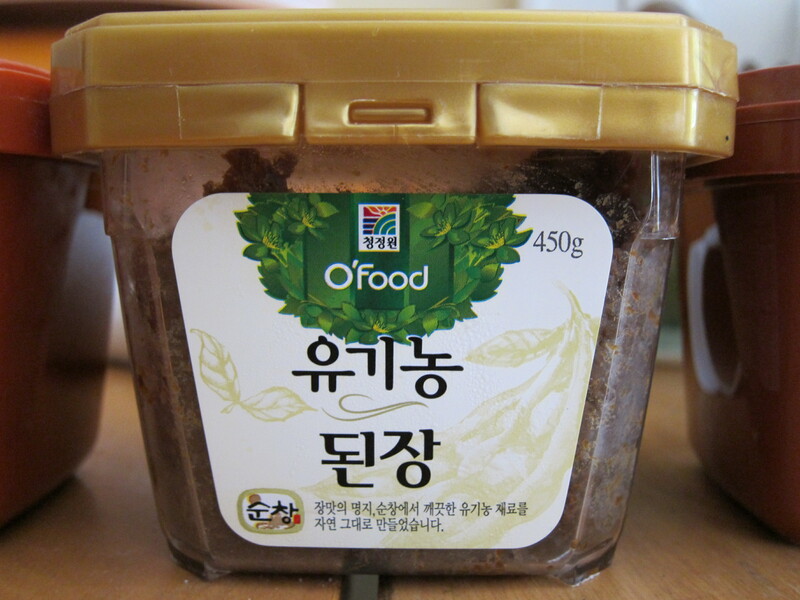 I have the O’food brand one in my fridge now and you’re right — it doesn’t taste like doenjang at all. They replaced all the bean flavor with salt. have you guys come up with a title or cover imagery yet? i hope it involves diane’s socks, that certainly got a visceral reaction from me! Annamatic, let me know if you find a great one! Carolyn, you have answered my prayers. We can call it, “Smells like Diane’s Socks”! I would like to ask you about the process of making doenjang…especially the 해찬들 (Haechandle) brand. I found that one of the ingredient is elthyl alcohol. So I want to ask, what is the amount of elthyl alcohol do they usually include to make doenjang? And about the elthyl alcohol included, is it from some kind of ordinary alcohol drink? Or if you know about muslim’s halal criteria, is 해찬들 된장 halal? As far as I know, alcohol is not traditionally used to make doenjang. I’m guessing some of the commercial brands use ethyl alcohol as some sort of preservative. I don’t know whether an imam would consider such doenjang halal, but to be safe, you may be able to find brands that don’t have any alcohol. The two types of Haechandle brand doenjang I have don’t list alcohol as an ingredient. Which one do you have? Hi Cuna, Sorry it took me awhile to check. No, according to the ingredient list on mine, this one does not contain alcohol. I stumble on your blog when looking for doenjang info. I’ve same concern as Cuna. Can you help me to translate the ingredient list from the label? Hi Rini, I’m sorry it took me awhile to get back to you. I had to look up some of the words. Unfortunately, only the first photo is of the ingredient list and it does list “주정” which is alcohol. The other photos seem to be of instructions on how to store, etc. Feel free to send me photos of different portions of the labels. Look for the part of the label that has percentages. Thanks for your reply. The picture no 1 is for gochujang from Deasang company. The brand, I believe is Sunchang? I’ve check at their web site, there is no alcohol. So, which one is true? Rini, I’m having trouble finding the website for the company. Can you post it here or email it to me? The web add is http://www.edaesang.com/c/c_1.asp. Hey Rini, I’m happy to help! Unfortunately, I can’t give a very definitive answer. I think the website is listing what it’s gochujang is generally made out of, not listing every single ingredient in the regulatory sense. The word I saw on the ingredient list in your photo was “jujeong,” which means “spirits,” but my Korean is too basic for me to know for sure what it means in this context. For all I know, it could mean ethyl alcohol which some people think is permissible: http://www.central-mosque.com/fiqh/ealcohol.htm. In any case, I am definitely not an expert on this! So sorry I can’t give you a clearer answer. I’ve stumble on your blog when looking for doenjang info. I’ve been interested in trying to cook the korean dishes for a long time, but i’m very concern of the ingredients involved as there is no halal logo on the packaging. May i have the info as to which brand of doengjang did you decided to purchase? according to my local fatwa, if the alcohol used in food making as preservative then it’s considered halal, as long as the amount is not intoxicating and the source of alcohol must not come from the process of beer or wine making. i’m sure there are many other brands that do not contain alcohol except the alcohol present as a natural by-product of fermentation. Thanks, you clearly know know more than I do! I can check the ingredients when I get home, but I’m out of town for a week. So sorry! you’re welcome Grace, no worries. i hope this can shed light on the alcohol issue so that everyone can enjoy wonderful Korean made products. i love gochujang and there are plenty of doenjang sold in my country, i would love to try one some day. from your postings i can sense that Chung Jung Won brand is simply without equal. If you have a moment, would like to ask your opinion. I was checking a kelp product by Haioreum. Got it in H-Mart (http://www.hmart.com/shopnow/shopnow_newsub.asp?p=846034021143). Same logo as in the picture above. But according to http://www.trademarkia.com/haioreum-78374700.html, Haioreum is a trademark owned by H-Mart. 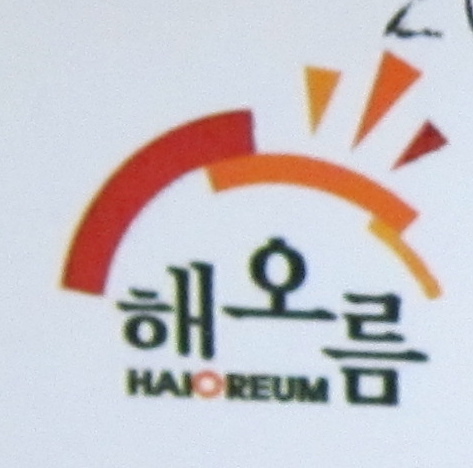 It is totally possible that there is a Haioreum in the U. S. and one in Korea. (1) Can you tell something about this company Haioreum? U. S. or Korean? (2) Do you know if the Kelp by Haioreum is a good quality product, such as free of toxins and pollutions? It does not seem to be organic. Is there a particular doenjang with no added MSG? Thanks, I would like to know which ones have and does not have monosodium glutamate (MSG) as well. Do you refrigerate this or even Gochujang at all or just keep it in the cupboard? Just curious, since it becomes brick like in the fridge. I found your blog when I was looking for info on sunchang gochujang (same case as cuna and rini) hope you dont mind answering my question hehe. I just bought one and unfortunately i didnt notice it contains unknown ingredient (for me). It says that this gochujang was made from 6% orion. Do you have any idea on this ingredient? Thanks in advance! Hi everyone! Can anybody tell me how to eat….where to use or where to mix doenjang? Be very glad if anyone can help me. Hi may i know what do you mean by doenjang is hundred times more assertive than miso? I think miso soup is nothing short of amazing and it is the icon of Japanese cuisine in the same way as doenjang stew. hi there . i would like to ask someting about doenjang . 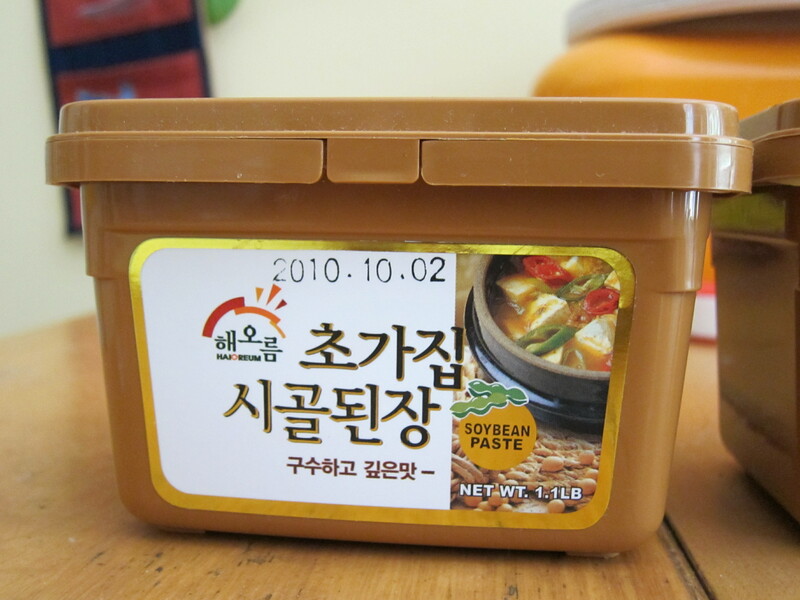 i have bought korean doenjang at supermarket. the brand is haechandel . it doesn’t have halal tag . but at the box doest’t contain non-halal food. all the ingredient is halal . can i know it halal or not ? I’m so sorry, I wish I knew the answer but I don’t. can u please nswer me? what is orion 6%?